Come and see the draft Windsor 2030 plan for central Windsor. If you’re not currently a Forum member and would like to join to help make a better Windsor, please get in touch using the contact form at the bottom of this page. After the success of Prince Harry and Megan’s 5-star wedding in Royal Windsor, the Windsor 2030 Neighbourhood Plan is once again taking up the reins of ensuring a 5-star town for residents, workers, businesses and visitors. 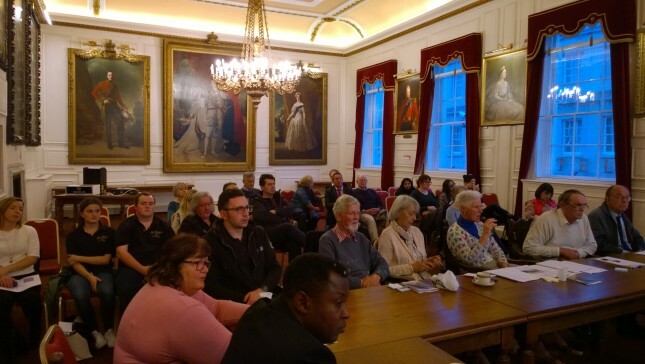 The key players in Windsor town centre’s neighbourhood plan were central to the planning and delivery of the royal wedding so this month (June) is our first meeting in a while. Windsor can be very proud of how the whole town came together to make a magical atmosphere. This is a special thank you to all the staff in every shop, business and service who did so much extra work to make it all happen and to make us all so proud of Windsor. The amazing atmosphere of the big day sent out a message to the 2 billion people who watched it on TV around the world that Windsor is a 5 star destination for romance, history, pageantry and celebration. We look forward to welcoming them in person. Thank you to everyone who came along to the Windsor 2030 July Forum. We were delighted to welcome so many traders from St Leonard’s Road before the forum, to share views on how the Central Windsor Business Neighbourhood Plan can support businesses and create a bustling atmosphere. We will be feeding back ideas and suggestions to the borough and into the draft policy where appropriate. The meeting was followed by our regular forum where the steering group shared plans to apply for a Heritage Action Zone grant which, if successful, would be used for improvements to the ‘gateway’ to the town centre from the Alma Road coach park and to improve the link between the town centre and the river. Updates were also discussed on the draft policy for the Neighbourhood Plan. The next Windsor 2030 Forum will be held on Thursday, September 14. Further details to be announced shortly. If you live, work or own/run a business within the Windsor 2030 boundary please contribute to the Neighbourhood Plan for a Five Star Windsor. Get in touch through the Contact page. The Steering Group of the Windsor 2030 Neighbourhood Plan are planning to hold the next Forum meeting for registered members on July 6, 2017. Full details will be posted shortly. To register please use the Contact page here. NB, to all Forum members, there is a Forum meeting on Thursday this week. The draft plan will be presented. We are also looking for new steering members so if you are not a Forum member but interested in joining, please use the contact form below. Thursday, April 27, 2017 at 7.00 for 7.30 pm. The Windsor 2030 Neighbourhood Plan wishes everybody a Happy New Year. We’ve made huge progress in 2016 and want to give a big thank you to all those who helped. We now have any even bigger year ahead. At the end of last year the Windsor 2030 Forum met and has been commenting on the draft policy for the Central Windsor Neighbourhood Plan for Business which is now being updated by policy writers. The document, outlining the plan’s vision for a Five Star Windsor, was presented at the AGM and Forum meeting held at Cinnamon Café on November 29th. The group’s chair, Dermot Whelan, welcomed new members to the Forum and gave an update on the plan’s progress. The draft policy is not yet a public document but the next stage will be to hold pre-submission consultation, which will be open to the public, expected to be in early spring 2017. Anyone who lives or works within the boundary of the Central Windsor Neighbourhood Plan for Business can apply for membership of the Forum – click on the ‘Contact’ tab at the top of this page.